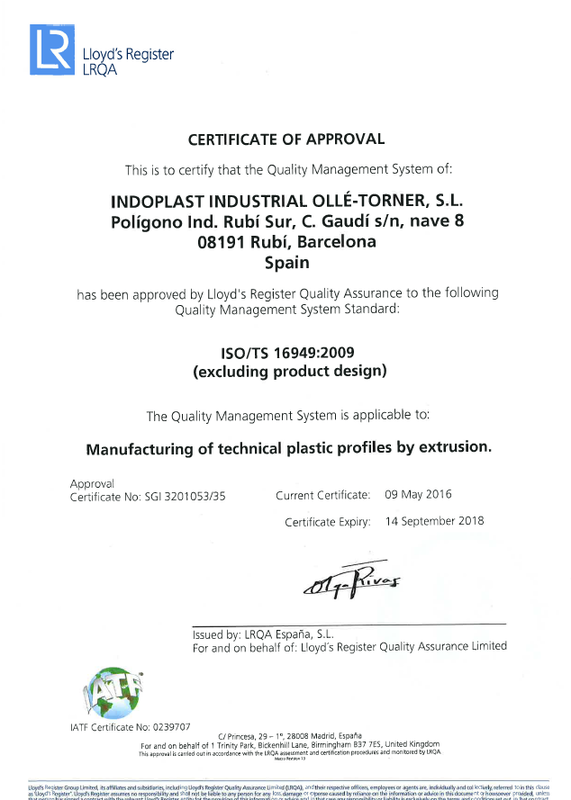 We are pleased to announce that INDOPLAST has managed to make the transition from the new IATF 16949: 2016 automotive regulation and also from the ISO 9001: 2015 management system standard. These certifications, once again, confirm the company’s commitment to quality and continuous improvement. We continue working to give a better quality to our customers. It was one of the most important targets for INDOPLAST since 2 years, and the day 13/04/2016 audit Phase 2 was exceeded. Therefore INDOPLAST currently has achieved one of its main objectives in the Quality section for this 2016. In order to double the turnover in the next four years, we have developed a strategic plan, that aims for a structured growth in the sectors in which we operate: automotive, construction and industry. To undertake this plan, the company will invest in a new flexible production line of profiles, which will allow us to produce all kinds of TPE, TPV, PP and PVC basic profiles, with self-adhesives, aluminum, hotmelt, and applying flocked tapes. This expansion plan includes a new layout and new plants for storage of 950 m2. The aim of the company is to reach 15 million m billing in 4 years becoming a leader in technical profiles production systems in the European market, and growing in the US market. In order to continue to give greater guarantees to our customers, during 2015, the company has begun the ISO TS16949 certification process, and the final audit report is expected in April 2016.